Wowzers. I have often felt this was a forgotten little gem of cinema. This is an oldie, but totally a goodie. A wonderful cast of performers bring this black and white classic to life. Olive Films has done a lovely job in picking this forgotten classic. SO many good films never seem to get the new outlets they deserve, but thankfully there are companies like Olive Films that give new and important outlets to these classics forgotten by time. This is being brought out to a new generation to enjoy. Starring one of my favorite actors of all time, who needs no introduction, the one and only Sidney Poitier. He has graced the cinema world with a mastery beyond simple words to describe his importance in film. He has starred in some of the greats of cinema. One that is, my personal favorite. The film I highly recommend and always praise is 1965’s A Patch of Blue. 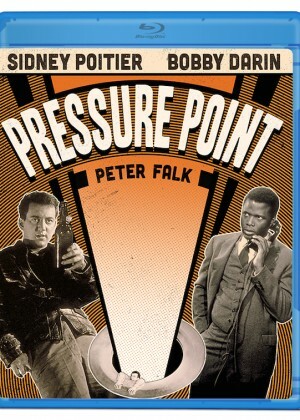 In Pressure Point, Sidney stars as the character simply known as Doctor. Like all his other performances, the role is flawless. Also starring the one and only Peter Falk, who will always be Colombo to me. And the heart throb singer Bobby Darin. A great and interesting cast bring this film to life. This is a dramatic film that makes its point and leaves you satisfied with the final conclusion. The plot is about an institution in 1962. Your main character is a psychiatrist played by Poitier. The doctor is trying to place one of his patients with another Doctor, because Poitier's and his patient is basically butting heads. The Doctor explains that there was another patient that was a Nazi sympathizer that he had to deal with. This ordeal took place 20 years before and so begins a part of the movie, while you flash back to tell the story. The original prisoner is filled with hatred and most of all psychotic behaviors. There, you the watcher witness this man’s life, and the torment he went through, and also the changing of hatred inside him, and the lack of emotions for others. His desire to torment others is showcased. But here is the catch, only the doctor knows the truth, because the prisoner is a model person while in the presence of others, and so the doctor has a major dilemma. The movie is mixed with a massive emotional intensity. It talks about hatred, race, Nazism, sociopathic behavior, religion, nature vs. nurture, antisocial personality disorder, beliefs, psychiatry. One has to realize that when this movie was made, in was the 1960’s and the tension of race, and the politics of race was wide spread across America. The war of skin color was full force during this time period. You can see that tension inside this film, it displays itself vividly and perfectly in the storyline and direction of the film. This dark, dramatic film was directed by Hubert Cornfield. Cornfield did not direct many films but the ones he did, stand out. Another favorite of mine is 1968’s The Night of the Following Day. He also directed the forgotten about 1960’s crime thriller, The Third Voice. He only directed from 1955 to 1976, but those few years as I have said, he left some memorable films and Pressure Point is defiantly one of those films to remember. He not only directed, but he wrote screenplays, including Pressure Point’s screenplay which was based on the short story called, “Destiny’s Tot" by Robert Lindner. Now I have to mention the cinematography for the film. It was done by one of the greats of Hollywood. American cinematographer Ernest Haller. Haller has done many masterpieces of film. Mention of his films showcases his mastery. From the amazing, 1935’s Captain Blood, 1939’s Dark Victory starring my favorite female actress of all time Bette Davis. He was responsible for the cinematography in 3 of my all-time favorites films. My number 1 choice of my top 100 films, the one and only 1939’s Gone with the Wind. The flawless 1955’s Rebel Without a Cause, and the dark brilliance of 1962’s Whatever Happened to Baby Jane? His mastery garnered him 7 Oscar nominations. He won for Gone with the Wind which is a no brainer by looking at the brilliance put into that film. He worked on well over 180 projects. He was one of the greatest cinematographers ever to grace the cinema world. He and director Cornfield actually worked together many times. Before Pressure Point they worked together on Plunder Road and The 3rd Voice. I have only ever seen this twice before. I think one time was on TV and the second time was on a VHS. Seeing it again for what basically is the first again, is a wonderful way to treat a film. It has never looked any better. I thought this Blu-ray by Olive Films was a great new outlet. It looks better than it ever has. Comparing it to TV and VHS, that’s a no brainer on how good it looks. Another fantastic film to experience on Blu-ray. A great outlet to a fantastic film that has been over looked by time. It’s a great piece of cinema that should be praised and expressed. It’s a character study. A wonderful reality of the inside of the human mind. The idea of nature and nurture aspect of psychology. A great directed, acted, written film that needs to be seen, and now look no further than this lovely blu-ray by Olive Films.